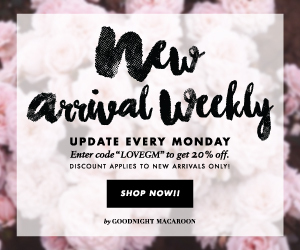 Hello Friends and welcome to one of the biggest posts of the year! My yearly favorites! Today, I'm sharing my top 16 products of 2016 - all items I feel like I can't live without. Obviously, there are more things I could have included, but that would take foreverrr, and whose got time for that, am I right?! So I thought long and hard about the products that have changed my routine for the better or that I feel like I couldn't get ready the same without. 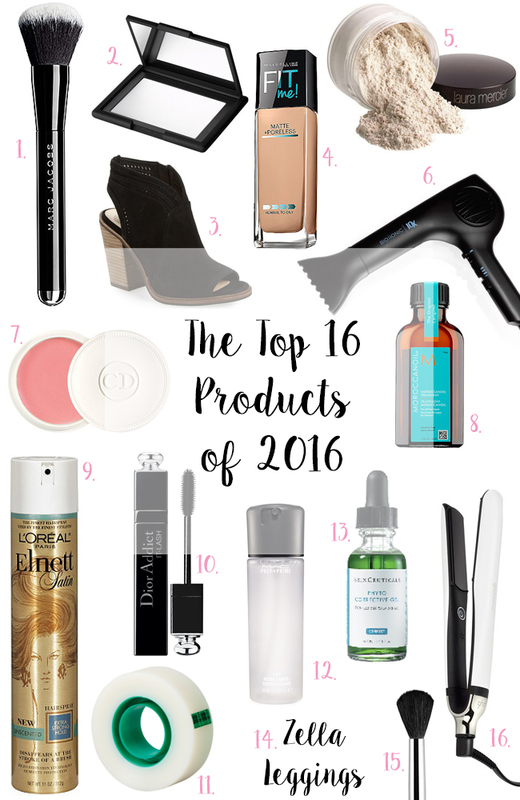 And here you are...drum roll please...my top 16 products of 2016! 1. Marc Jacobs The Face 1 Brush If you've followed me for long then you've probably heard me talk about this brush before. I purchased it well over a year ago and have been using it to apply my liquid foundations ever since. I kid you not, I haven't used another brush since - and that's really saying something! It comes with a higher price point, but the quality is top of the line. It's durable, washes well and is soft to the touch. A good brush like this one could even last you a lifetime if you take care of it like you should (i.e. give it a good bath in Johnson & Johnson baby shampoo once a week). The reason I like this brush so much? It gives a flawless and effortless application of product onto the face - no streaking and no excessive blending necessary. I now own four Marc Jacobs brushes and have nothing bad to say about any of them. 2. NARS Translucent Crystal Light Reflecting Setting Powder (Pressed) Much like the Marc Jacobs brush above, if you've been following me long, then you know this is a holy grail product of mine. I've been through at least six of these powders because it's the only one I use all over my face to set my makeup. I've tried numerous other versions from other high-end brands and from the drugstore because believe me, I'd love to give you a dupe, but I haven't found it. It's not chalky, doesn't create a white cast on the skin, creates a very smooth finish, and doesn't need additional applications throughout the day (with my skin type I stay matte all day long). Also, if you're willing to spend the money, it'll last you for a very long time. It's also wonderful for travel or your purse because it's pressed and won't make a mess. 3. Vince Camuto Perforated Open Toe Bootie Originally, I was going to include my favorite knee high boot from Vince Camuto, but it looks like they are finally sold out, so I'm subbing in my second most worn shoe of the year, and that's my black open toe bootie. I randomly stumbled upon it one day at Nordstrom when I was shopping for something else, per usual, and the salesman told me to give it a try. I reluctantly said "yes" and thank goodness I did! Nordstrom needs to give him a gold star because these are incredibly comfortable and so versatile. I wear them with leggings, skinny jeans, flared jeans, dresses, shorts...etc. Which is why I feel like the price point isn't so bad. I've absolutely gotten my money's worth and if I could only buy one bootie all year, it'd be this one! It also comes, in a tan and a grey as well. 4. Maybelline Fit Me Matte & Poreless Foundation I feel like it's been a while since I talked about this foundation, but it's hands down my most used foundation of the year. This summer, while perusing the aisles at CVS, I decided to give it a try. No one prompted me or wrote a review and I did my best to choose the right color. Well, let me tell you, not only did I pick the perfect shade, I all of a sudden realized it was everyone else's favorite foundation too. I guess I was super late to the game, but at least I got to play haha! This drugstore product rivals my high-end foundations and I even received compliments and inquiries at the Chanel counter (so it's got to be good right?!). The coverage is fantastic, the color range is superb, it looks beautiful in pictures, and it's less than $8! 5. Laura Mercier Translucent Loose Setting Powder (for baking) I mentioned my favorite translucent powder above for all over coverage, but this is my favorite for baking under the eye. I use this to set my concealer for a smooth finish and lasting coverage. It also adds an extra brightness that I prefer when doing my makeup. And it lasts foreverrrr! If you don't know what baking is, I recommend checking it out on YouTube. Basically, you take a dry sponge (my fav is the Beauty Blender) and you dip it into an excess of loose translucent powder. Then you pack it on to the areas where you concealed, usually under the eyes. You leave a good deal of the product (your undereye should look white) for several minutes to "set" and then you wipe away the excess. And yes, I've tried other products to do this, but none compare - most bloggers and YouTubers will agree! 6. Bio Ionic 10x Blow Dryer Even though I received this blow dryer in November, I'm including it in my yearly favorites because it's incredible. I'm going to be completely candid and start with the fact that it's expensive. Okay, it's $330. Wait, wait...do not quit reading yet. You may think this is crazy or unnecessary, but hear me out. First and foremost, I treasure my hair and I believe in a good quality blow dryer. One designed to help smooth my strands and prevent as much damage as possible. Another plus? This dryer weighs in at only one pound, making it ideal for travel - and also won't make your arm so tired if you have thick hair like myself. The best part of all? It has a ten-year battery life and a ten-year warranty...sold! 7. Dior Creme De Rose Lip Balm If you want to do your lips a favor in the cold winter months, buy this lip balm. You're going to say, "Amanda a high-end lip balm, really?! "...and yes, really. I didn't believe the hype originally, but I kept hearing people go on and on and on about this product by Dior. So I finally caved and purchased one for myself. I don't even like rose scented products so I was sure I was going to be underwhelmed. And yep. I was SO wrong. This lip balm, one, lasts forever, and two, is the best conditioning product I've ever used on my lips. I literally cannot find anything that even remotely compares. I keep mine in my bedside drawer and each night before bed I apply a generous amount to my lips. It's been a lifesaver in the dry California weather. 8. Moroccanoil Treatment (For all hair types) I don't know what I would do without my Moroccanoil treatment. I have fairly coarse and very thick hair and this is one of the only products I use that keeps my hair manageable and shiny. My hair is so thick that I can actually get away with using this oil every day without my hair getting dirty. I like to use it primarily when my hair is wet before blow drying and then right before straightening. And then I use it throughout the week if the weather is humid, which luckily, in California it usually is not (except for the last couple days of rain...I was told it doesn't rain here...good thing I've got good hair products!). 9. Loreal Elnett Satin Extra Strong Hold Hairspray (Unscented) I loveee this hairspray! Originally I purchased the scented version and hated it because it smelled so strongly. But the unscented version is so much better and a fantastic medium between light hold and heavy hold. I know it's called extra strong hold, but it still gives the hair movement and doesn't leave it feeling dirty when you brush your hair out at the end of the day. I hardly ever use any other hairspray and I own several options. I also love that they sell this in a travel version so that I can keep my hair routine when I'm away from home. Or you can carry it in your purse or gym bag! 10. Dior Addict It-Lash Mascara I have talked about this mascara sooo many times! It's the only mascara I will use on my lower lash line and I've been using it for years now. It's the only mascara I've tried that doesn't transfer under my eye during the day. Since I only use it on my lower lashes a tube lasts me for quite a while so the purchase price isn't so bad. You can obviously use it on your upper lashes too, but I don't so that I can save it for the bottom and because I have several favorites I love for volume and length and thickness. 11. Invisible Tape At first you might laugh at this being one of my top products of 2016, but it's been an eye makeup game changer! I don't think I will ever do a cat eye without tape again - it's just so easy! If you haven't seen my eye makeup routine go ahead and check it out, as it explains more, but basically I use the tape as a guide for my liquid liner which creates a flawless perfect finish. If you haven't tried it and like liquid liner, go grab some tape out of your desk drawer and give it a go! 12. MAC Fix+ This is an oldie, but a goodie. I'm sure most of you have heard about Mac Fix+ at one time or another. It's a face refreshing, makeup setting spray. I use it before my makeup to hydrate my skin - it's also wonderful on trips when you're in an airplane with dry circulating air. I also use it after I've put on my makeup, not to keep it on longer, but to help it blend into the skin with a more flawless finish and a pretty glow. I feel like I couldn't do my makeup without it - it's a great way to avoid having "cakey" foundation & powder. I'd say I've gone through a good ten bottles or so in my lifetime. 13. Skin Ceuticals Phyto Corrective Gel For me, this has been a skincare game changer. I purchased this product after getting a hydra facial at the recommendation of the facialist. After I moved the redness in my skin got pretty bad... so bad I actually hated having to take my makeup off. So I started using this gel in the morning and at night, and not only did it calm my skin with a cooling effect, it drastically changed the redness! I actually ran out a couple weeks ago and have been dying without it. You better believe I'm about to use some of my holiday gift cards to repurchase. If you're suffering from facial redness and/or irritation I would definitely give it a try. You can even use it on your neck, arms, chest and the back of your hands. 14. Zella Slim Fit Leggings As for clothing, Zella slim fit leggings have been my jam! Not kidding, I wear these, probably four or five times a week. I bought two pairs during the Nordstrom Nsale and designated the as "non-workout" pants because I didn't want them to wear out too quick. I use them as pant-type leggings only. Although they are absolutely designed for athletic wear. I tried on the high waist version but didn't like them on myself. So I bought the slim fit mid rise style instead and they are perfect! Quick note: they do run big so you can size down. I normally wear an XS and purchased an XXS - and they don't cut off my circulation haha. I could probably get away with wearing my usual size, but I like to feel like my leggings are holding me in. 15. Sigma Tapered Blending E40 Brush Again, if you haven't seen my eye makeup routine, make sure to check it out! This is the one makeup brush I couldn't live without. It's the most wonderful blending brush and what I use first to apply my transition shade in my crease. It's affordable, easy to use, and mine has held up really well through lots of use and washing. Definitely, a must have for anyone! 16. GHD Platinum Straightener 98% of the questions and comments I receive are about my hair, which I think is funny, but very sweet! It happens all the time, even if I'm sharing a piece of clothing or an outfit. So this is the tool I use to create the magic - haha! But really, this is the only tool I use other than my Bio Ionic blow dryer to style my hair. I use it to straighten and also to curl because it has such nice beveled edges. And I got mine in white so it's very chic and looks beautiful sitting out! Yes, it's a splurge, but much like the blow dryer, it's designed to treat your hair nicely and should last you for quite some time. I kept my last ghd for over four years. Plus, it comes with a warranty.